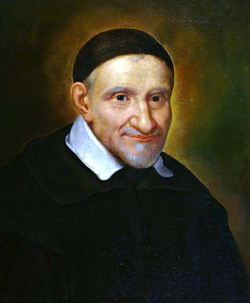 St. Vincent de Paul (1581-1660) was founder of the Congregation of the Mission, Daughters of Charity, Confraternities of Charity, and Ladies of Charity. A man of deep faith, keen intellect, and enormous creativity, he has become known as the "The Apostle of Charity" and "Father of the Poor." His contributions to the training of priests and organizing parish missions and other services for the poor shaped our Church's role in the modern world. I know that our parish has a St. Vincent DePaul Society which collects food and clothing for the poor. You can find out more about this society at www.svdpusa.org . Maybe you can help them out by a donation of money, food, clothing, or time. Your promotion of the priesthood. To minister to the poor.